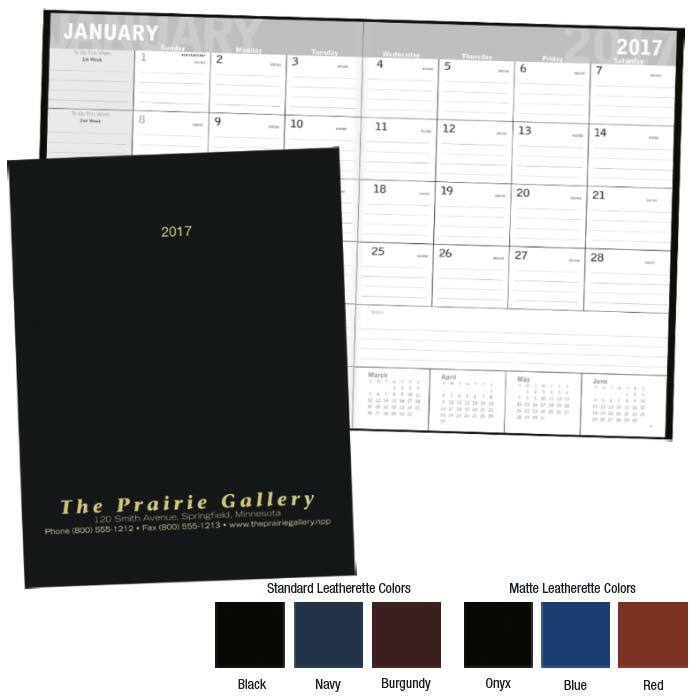 Custom Imprinted Monthly Planners, Promotional, Customized, Personalized, Imprinted Monthly Planners, Printed, Advertising. To see the Monthly planners display page, click here. The best seller monthly planner in the market for the coming year. Order early because at these low prices they go very fast! Size: 8-1/2"W x 11"H closed. Back to the Monthly planners display page.| Back to the calendars display page. 14 month planner for December, present year, through January the following yea stapled binding calendars appointments Made in USA. Imprinted with your logo or message on outside front cover. Metallic Gold or Metallic Silver. Colors other than gold or silver available at an additional charge. Product Colors: See color chart above. Outside Front Cover - Bottom: 7"w x 2"h, 2-color(s) max. Note: Orders placed after October 22 might take 4-6 weeks to ship. Price of Monthly Planner includes one color hot stamping on front cover. Logos & typesetting: See this link. Requirements to prepare, and/ or to e-mail artwork to us, click here.. Gift Envelopes: bulk $0.18 each; inserted $0.32 each. Plain Envelope: bulk, $0.16 each; inserted $0.32 each. Random sample: $10.00 each. Shipping charges will be additional. • Mail as an announcement or invitation. • Great gifts for the holiday season. • Monthly planners live up any promotion or event. Requirements to prepare, and/ or to e-mail artwork to us, click here. Bulk, approximate 20 Lbs./100 PCs. FOB factory. We will use our discretion as to the best method to be used. Please call us for approximate freight charges when ordering. From receipt of complete order and approved artwork, please allow approximate. 13-14 working days production time in the plant on customized merchandise, unless otherwise noted. We reserve the right to ship and bill 5% over or under the ordered amount on custom imprinted merchandise. Order NOW and save time and money! To place your order, click here. Then follow the instructions in the ordering form, or call us at the phone number located at the bottom of every page to place your order. Remember. Customer satisfaction and high quality service to our customers is our main goal. Back to the calendar display page. E-mail to: Customer Service, click here. To e-mail your artwork, purchasing orders, questions, or inquires, click here.